those who voted against his Yankees stadium plan by booting them from the community board (followup story here); and second, the growing opposition to New Jersey Nets owner Bruce Ratner’s plan for a basketball-arena-and-skyscraper development in Brooklyn for being too damn freaking ginormous. And I haven’t even gotten a chance to weigh in on the Mets’ demands for a new commuter rail station or the plans to shoehorn a new Madison Square Garden into a landmarked Manhattan post office building – watch for them in July, perhaps. Finally, just this week I covered the release of the new federal welfare rules by the Department of Health and Human Services, a hugely important development for anyone who relies on public assistance – or any state taxpayers who pay the bills for the programs – but which, aside from the AP and the Washington Post, the daily media mostly greeted with complete disinterest. In a nutshell: The Bush Administration has drastically reduced the number of allowable “work activities” under the welfare law, which could lead to a renewed wave of families being kicked off the rolls. Outside of a nutshell, read the full article. mid-July. Not sure yet if it’ll be on the web as well, but if it is, I’ll add a link to it here. fact, but not if you want them answered. Let’s see, war on the poor, stadium ripoffs, natural disasters … yep, that about covers it for this month. I think I need to cheer myself up by listening to the Art Brut record a couple of times in a row. I recommend that you do the same. 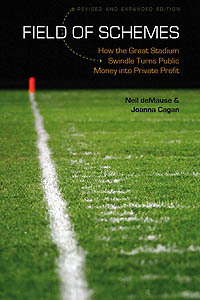 This entry was posted in Chats, Development, Stadiums and Arenas, Welfare and Poverty by Neil deMause. Bookmark the permalink.